When I first opened Sugar Bytes’ Factory up, I thought to myself: “Good lord, there aren’t enough hours in the day to figure this one out”. But I got into it and had it pretty much figured out within an hour, all without cracking the manual open. It’s reasonably intuitive, considering its somewhat unconventional GUI feature-set layout. It’s comprised of two oscillators (with Sub and Noise), one resonant multimode filter, one distortion module, one amplifier, two ADSRs, two LFOs, one S/H module, four sequencers and three effects units. Signal flow passes through a 4-channel mixer while control signals are routed through an 8x10 matrix, which is ostensibly, the centerpiece of the interface. Each of the two identical oscillators have ten model types, including a granular oscillator, capable of importing the sample of your choice. I used the manual to identify a few cryptic control icons and to see what controls and elements made up each of the 10 oscillator choices. The manual is well laid out, written and illustrated. There wasn’t anything in the interface that I couldn’t find a definition or explanation of. 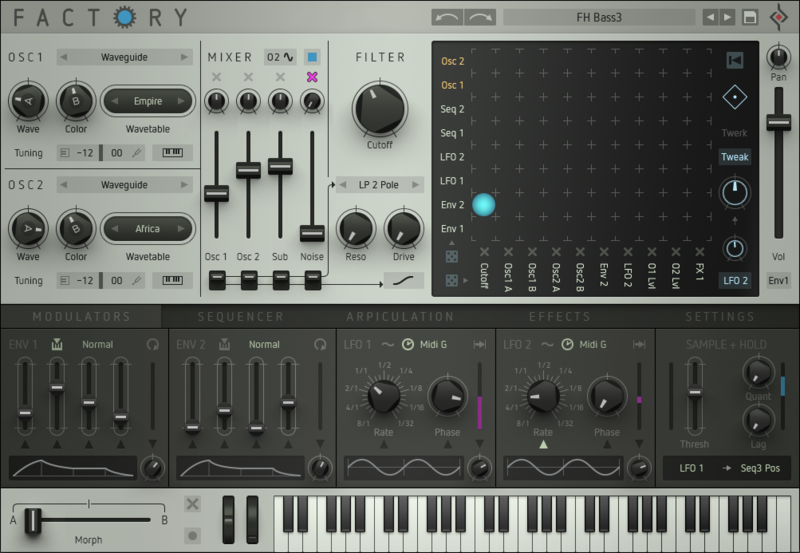 The basic GUI sports the oscillators, mixer, filter, matrix and amplifier in the upper portion, while below, 5 tabs to reveal Modulators, Sequencer, Arpiculation, Effects and Settings pages. 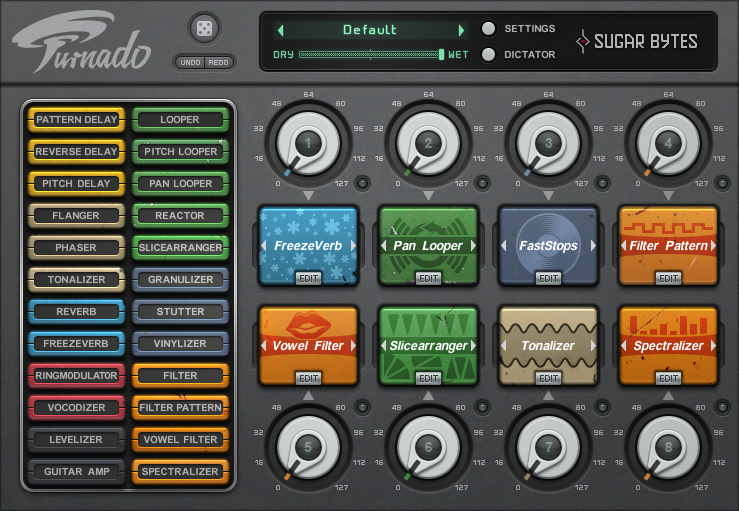 The layout of the GUI seems a bit unconventional at first, but all the traditional synth elements to develop the sound are pretty much in plain sight, so it wasn’t that hard to initially create something from scratch. Beyond the main signal flow area, it’s a combination of the Modulation Matrix and tabbed control pages that get things going. The Modulation Matrix is where most of the nuts and bolts of building a sound takes place. You can select sources and targets from dropdown menus along the left and bottom edges of the matrix. 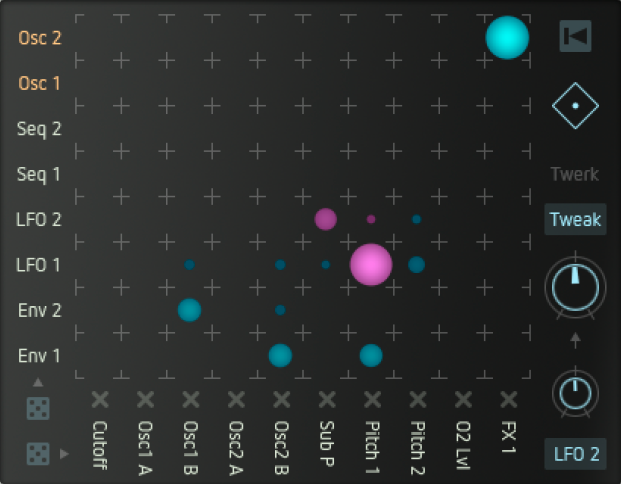 Dragging in the cross-point areas create blue and pink circles representing the modulation value. Blue is positive values, pink is negative values. There are additional tweaking and randomizer controls along the borders. It’s pretty straightforward. Everything else is handled by the five module tabs along the bottom. When I was unsure of a function, the manual provided a detailed explanation. It only took a few minutes to figure out what everything does. 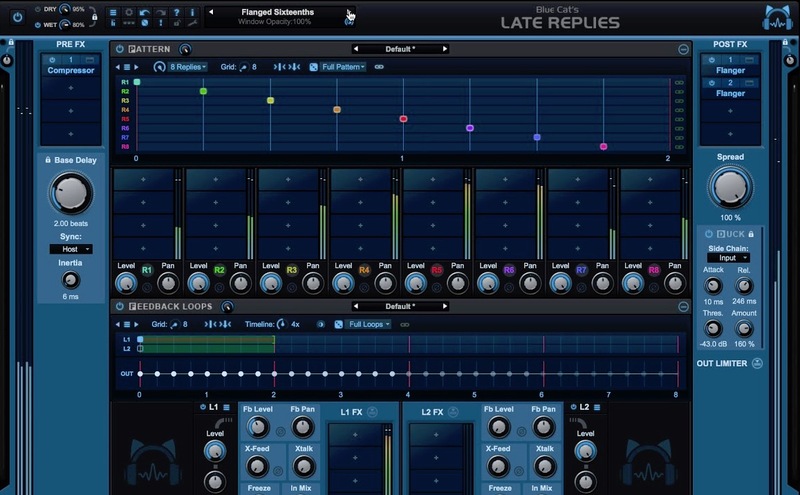 Although you can create fairly standard synth sounds quickly, it’s the degree and complexity of modulation routing to create motion that is the forte of this synth and it invites experimentation. 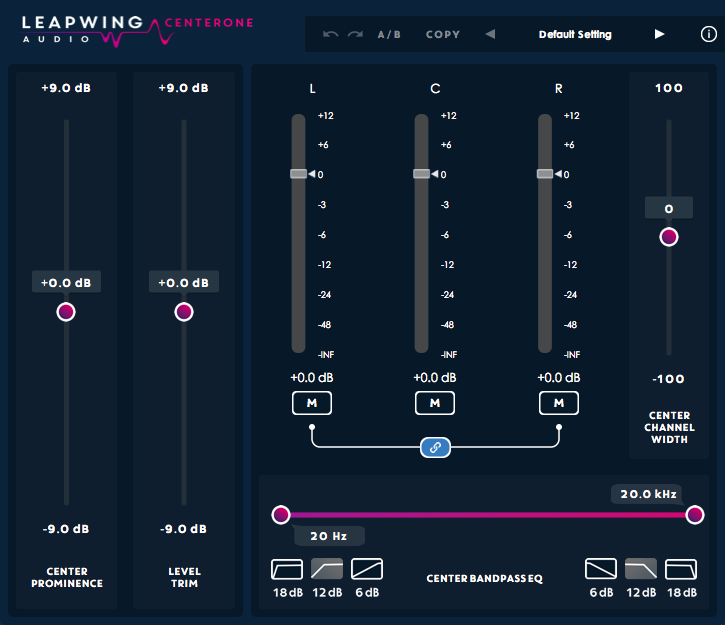 The Preset library has a good collection of examples to get started with. Once you get comfortable with how things connect and interact, you can easily get lost tweaking Factory…and I mean lost in a good way. The oscillators variations and modulation routings are capable of creating some very complex and beautiful sounding stuff. I found the four sequencer modules to be a standout in this respect. But after a few hours with the synth, I began to come across a number of shortcomings in the design that I felt were limiting the sound design process in a number of ways. I almost forgot to mention the A/B Morphing control. This is implemented in a very useful and clever fashion. There is something off-putting about a preset interface that doesn’t reveal its functionality clearly to me within seconds after opening it. At first glance, the layout and space allocation for the Trace (search) area was really off-putting to me. Personally, the first thing I want to see front and center is a Save and Load section with a standard Search text entry box. And in English, along with universally accepted, obvious-what-it-does iconography. I’m not interested in losing work for the sake of the someone reinventing the wheel to appear different from the competition. This is bread and butter stuff. No auto scroll when the selections made using the Preset Selection arrows in the Program list pass the bottom-most Preset. The menu remains in place. You have to stop clicking, move to the scroll bar and drag down to see what’s being selected. Un-leveled preset library. Some patches are actually much louder than they need to be while auditioning. Almost blew a speaker with a few of these. Patches under S/H control that start playing as soon as the preset is selected. I found no way to trigger a start or stop except to change the preset. Incredibly disconcerting when you click on these for the first time. 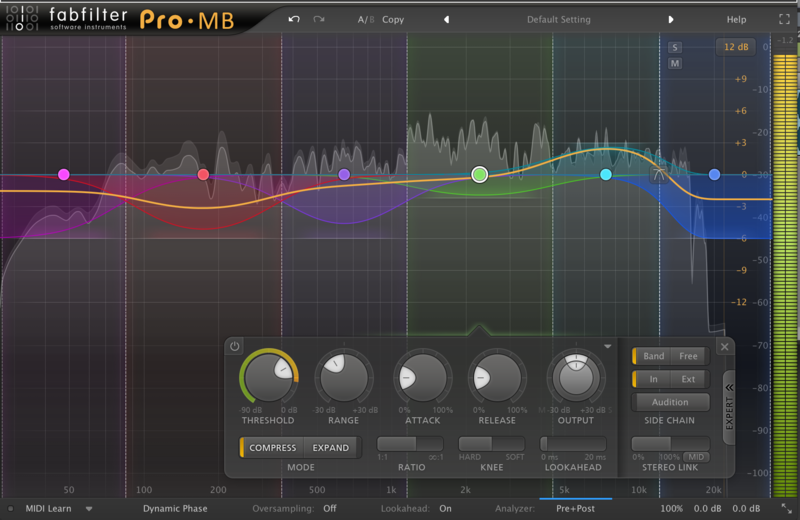 Not entirely sure of the practical application for presets that can’t be silenced other than by switching Presets. Examples would be Distant Pad, Evolver and Glory Pad. I’m not big on installing stand-alones. I don’t use them at all and I like to keep my Applications folder as uncluttered as possible. Unfortunately, de-selecting the stand-alone in the installer still dumps a folder into the Apps folder anyway. And I discovered that’s because it’s where the Manual is deposited. As far as I’m concerned, the manual should’ve been placed in the Sugar Bytes folder in the Documents pathway (on a Mac: [HD/Users/MyName/Documents/SugarBytes]) where I expected it to be. I didn’t even think of looking in Apps. And I didn’t find the “?” button until much later in my exploration. I’m kinda used to expecting a “?” at the top of the main interface…not buried in under a tab. Required? Really? I dunno…maybe this was tongue in cheek, but it came off as pretty pushy to me. This last thing may be more of a wish-list item (or rant) than a bona fide issue, but as much as I found the little Settings tab animated logo amusing (and it’s really well done) I’d like to turn it off. I’m not a fan of non-essential animated things moving in mission-critical elements of the interface. I’m sure it would save a few CPU cycles as well. Every cycle counts in my book. Put it in an “About Box” or something. I’d like to see the name of the parameter along with value I’m adjusting along the top of the interface. I’d like a 10x10 (or more). More is better. Simple contextual help definitions on element rollovers. 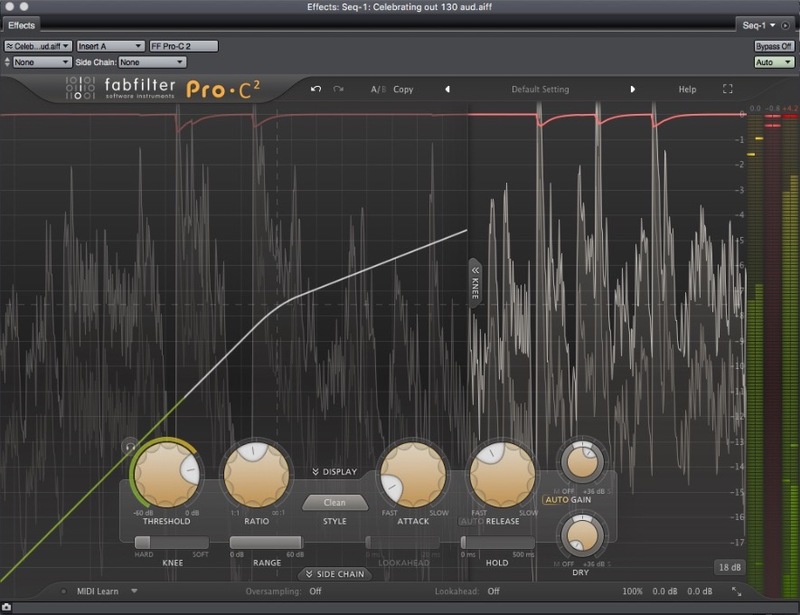 The ability to override the foldering of waveform presets. It would save time If I could see one big list. I’d like the ability to store/save/recall Modulation Matrix settings independent of the presets. I’d love to have the Morph fader included in the Mod Matrix target list. I’d like to have individual curve controls for ADSR’s. The unlabeled Envelope Shape knob, while useful for most quick and dirty curve shifts, just doesn’t cut it for me. Getting a nice sharp attack compromises the release time more than I cared for. I’d like to be able to just click on the curve segments in the graphic and drag up or down to morph between Exp/Lin/Log curves. I wish the Gate controls were placed directly under the trigger selection and Volume control. I wish I could select the duty cycle of the LFOs to freewheel in addition to key press resetting. I’d like to right click on any “source arrows” in the Modulators and Effects tabs to identify what modulator source is assigned. It’s really a matter of paying attention to the area you are working with. Looking over and squinting at the Matrix can get a bit tiresome. I’d like to see the Volume control renamed to VCA. Initially, I found it confusing, as it suggested a static standard volume control rather than a modulated amplifier. 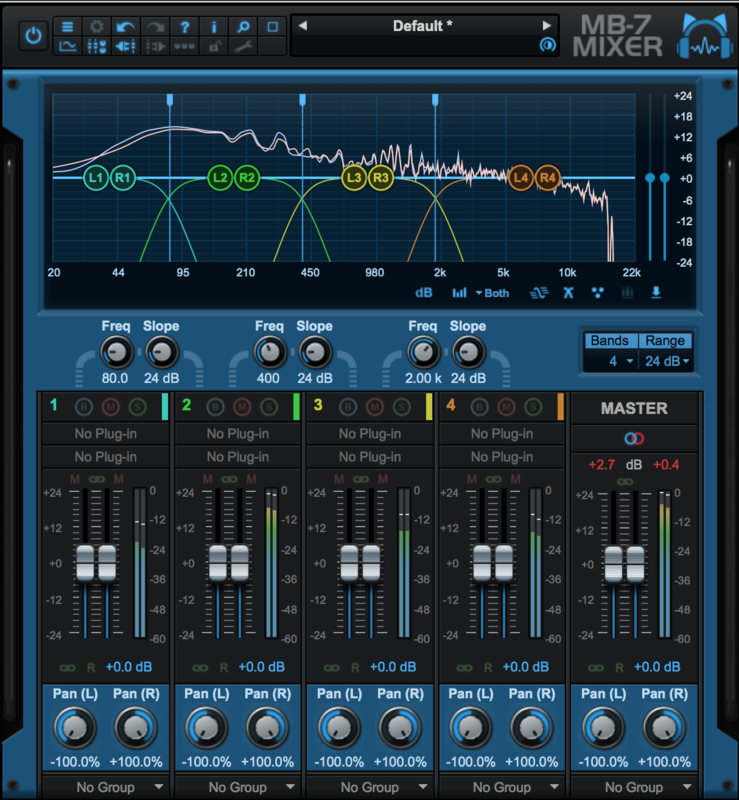 Users should immediately get the idea that it is actionable beyond raising and lowering the fader manually. I’d kill for a polyphonic Unison function. And while I’m at it: Unison that has detune amount control and a stereo spread control. I’d love pan controls for the main oscillators and noise. Getting a big stereo spread of these basic elements can eliminate using one of the three effects processors to achieve a stereo field. I’d like to see a more direct and quicker way to assign the mod wheel to a source/target pathway. I followed the instructions in the manual and it made my eyes water. I see a use for 1/2 & maybe 1/4 sized rectangle steps similar to the 16th, 17th and18th envelopes. I’d really found myself wanting a modifier key to temporarily hold onto the last envelope step chosen so I can drop that curve into any step, at will. Yes, there are a couple of shortcuts available, but I found that constantly opening and closing the menu really slowing me down as I was creating complex rhythm stuff. A good deal of the Factory’s usability focuses on the Modulation Matrix. Personally, I think it is too small, considering it’s (in my opinion), the most important element of the entire interface. I wish this part of the interface was larger…. simply because I can’t tell at a glance who goes where. It’s front page, mission critical stuff to me. Good excuse to expand it from 8x10 to something larger anyway. Wouldn’t mind being able to use more than a single wave cycle in the Transformer Oscillator. 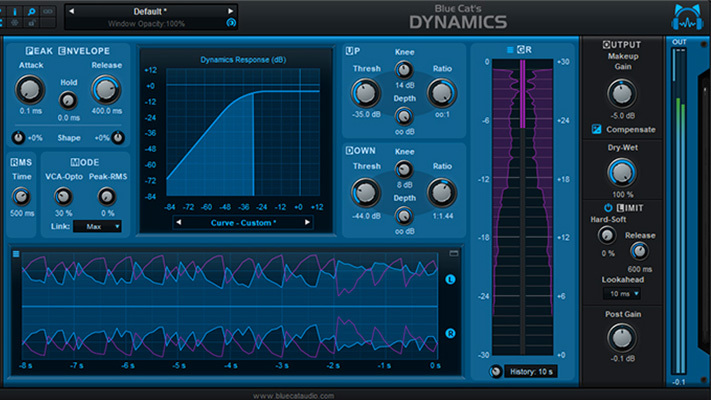 And I wouldn’t mind seeing a utility to generate my own wavetable from my own samples. It was a fun and novel synth to use. Considering what it can do, it was quite easy on my CPU. That’s a big plus. There are a ton of pathways that make the animation of the sound anything from nuanced to outrageous. It’s a real tweakers delight. But in my opinion, it could use some serious feature-creep to make its price point truly completive in a pretty crowded field. That’s the problem with people like me….we just want better.